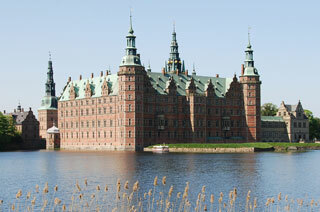 Frederiksborg Castle (Danish: Frederiksborg Slot) is a palatial complex in Hillerød, Denmark. It was built as a royal residence for King Christian IV of Denmark-Norway in the early 17th century, replacing an older castle acquired by Frederick II and becoming the largest Renaissance residence in Scandinavia. Situated on three islets in the Slotssøen (castle lake), it is adjoined by a large formal garden in the Baroque style. This article uses material from the Wikipedia article "Frederiksborg Castle", which is released under the Creative Commons Attribution-Share-Alike 3.0 License.